Chrichton's World: Review Slumber (2017): Fails to terrify even when it does it best to be sincere! Review Slumber (2017): Fails to terrify even when it does it best to be sincere! 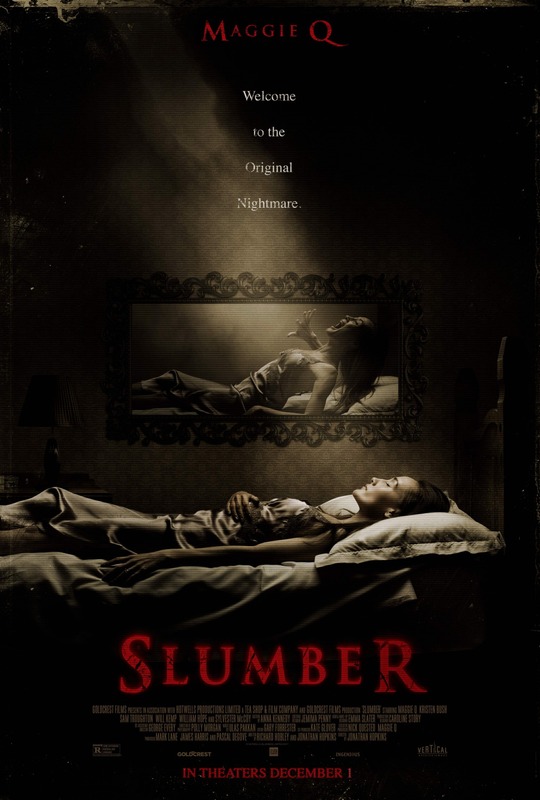 Slumber is a film that relies on a familiar tale that many might have experienced themselves. However it fails to build on that premise and come up with something fresh. The biggest problems that it follows stereotypical horror tropes like there is no tomorrow. And it doesn't make sense since a lot of characters blatantly deny or ignore evidence that is right in front of them. It's aggravating and unrealistic. I know perhaps it's too much to ask for a horror film to be realistic since it deals with topics that aren't real. However you can't allow yourself to fake the reactions of characters to the events they experience. Whether they are real or not at the time they occur they feel real. It's one thing to explain supernatural events with logic and common sense. But to still suspect someone for a criminal act while there is proof that clears the suspect is problematic. It makes you look stupid and ignorant. I really like Maggie Q and most of the time she gives a lot of credibility to the characters she plays. Here it's asked of her to be the opposite of a scientist with an open mind. And it doesn't really mash with what she has experienced as a child nor how she is supposed to be professional and competent. Slumber does manage to build up some tension and dread. Although it's pacing and stupidity of characters prevents you from getting truly immersed. At times it does feel like the makers of the film thought they were close to capturing the dread from for example the Insidious films. I could sense the intent. Unfortunately they failed miserably. After one or two scary moments I experienced not a single ounce of dread or terror. It was pretty laughable at one point. Especially when Amado played by Sylvester McCoy makes his entrance. You read it right. The seventh incarnation of Doctor Who has a small role in this flick. Sadly he can't save the film because the writing and direction is too unimaginative. Far too predictable. In this day and age that is unacceptable. Another big issue is the pacing. The film has a duration of 84 minutes which is quite short. Yet it feels like it's a two hour film. That's not a good thing. And I really tried hard to let the film get to me. Ultimately Slumber is a giant waste of your time since it doesn't do anything remotely fresh or creative. Maggie Q deserves and McCoy deserve better.